The firm has become a force in the industry by focusing exclusively on corporate advisory services. Bob Mohr gets a kick out of highmarking. The dangerous sport involves driving a snowmobile as far as possible up a steep backcountry mountain slope at a high rate of speed, without getting stuck in the deep powder, rolling over—or getting crushed by an avalanche. “It’s very physical, and it’s a pure adrenaline rush,” Mohr says. The chairman and CEO of Mohr Partners has been known to take risks in business, too. His company is one of the few real estate firms that still focuses exclusively on tenant representation and corporate services, and it’s one of the country’s largest. As the recession was getting under way in 2008, while others were pulling back, Mohr and his firm’s president, Ted Fredericks, decided to take advantage of conditions and expand. They’ve since doubled the number of Mohr Partners office locations to 20, and the investments are starting to pay off. He grew up in Indiana, the oldest of six children, and got a business degree from Indiana University, while also working the night shift at the local GM plant. After graduating he joined The Norton Co., the world’s largest abrasives manufacturer, and went on to earn his MBA. In 1984, he decided to take a gamble and get into real estate, moving his wife and young daughter to Dallas. But within a couple of years, the commercial real estate market here had tanked, and Mohr found himself out of a job. It was the perfect time, he figured, to launch his own firm. He was hooked on the entrepreneurial nature of the real estate business, and the emerging specialty of tenant representation. But he had an idea for improving the process: leveraging technology to create efficiencies. 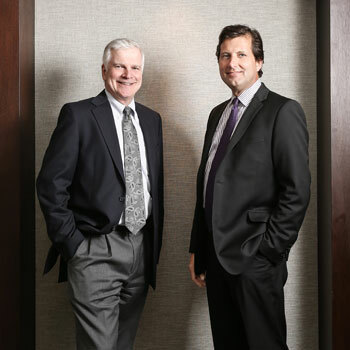 Ted Fredericks, left, and Bob Mohr say their firm’s singular focus on tenant work is a key competitive advantage. Along with its bread and butter—portfolio management—the company launched an affiliate, Mohr Capital, 14 years ago. In essence, it helps clients garner value for their tenancy. Mohr creates partnerships through which it either buys properties or puts up equity for real estate acquisitions. So rather than just renting the space, clients are able to get a better lease rate and a participation in the ownership. The firm’s customers work in a number of verticals, Fredericks says. “But more important than the verticals, which is slicing it one way, we do a horizontal slice. We tend to shy away from the Fortune 100s a bit, as they tend to view real estate as a commodity. The vast majority of our clients are Fortune 250 to Fortune 2000 companies.” They include Adecco, Sodexo, and Libbey Glass. Mohr also has a number of healthcare clients, and four years ago launched Mohr Health to develop medical facilities on their behalf. Fredericks was an engineer for Rockwell International when he was tapped to manage real estate construction for the aircraft and defense company, overseeing the development of about 8 million square feet of space. He joined Mohr Partners 16 years ago as head of project management and has served as its president for the past decade. Going forward, Mohr Partners sees opportunities in international work. Proposed rule changes by the Financial Accounting Standards Board could also be a boon, as many companies will require their leases to be restructured. Fredericks says clients are already having Mohr assume management of other leases, such as vehicles and large equipment like copiers, as the accounting guidelines will affect those things as well.